Here you will be provided with the information on installing a Let’s Encrypt SSL certificate on HostingRaja dedicated server. Before that let's understand the meaning of Let's Encrypt SSL, Let’s Encrypt is an open SSL certificate which is maintained by the Internet Security Research group. One of their major goals is to make the internet much more secured it is done by increasing the availability of SSL certificates. Let’s Encrypt SSL certificate is an absolutely free and it is as secure as any other forms of SSL certificate. A Let’s Encrypt SSL is valid only for 90 days. However, it can be renewed before its expiration date. While you are securing the .accessdomain.com (hostname) with Let’s Encrypt SSL’s. A Let’s Encrypt SSL certificate can enforce the limitations on the number of subdomains which can be secured. Due to its many limitations, it is not advised by many not to renew a Let’s Encrypt SSL certificate. It is recommended to update the hostname to a fully qualified domain name that you are owning to secure the Plesk Panel with the Let’s Encrypt. Plesk is having the native support for the Let’s Encrypt via a plugin which is found on the Plesk extension catalog. Extensions which are found in the official catalog have been vetted by the Plesk and it can be considered as safe to use. You need to log in to the Plesk Control Panel. Now you need to select the extensions from the menu which is on the left. 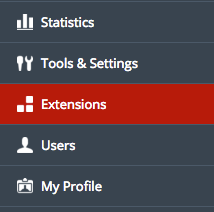 Now you need to select the extensions from the menu which is at the top. Now you need to find the Lets Encrypt extension and then click on install. This process could take a couple of minutes. If the installation is taking longer that 2-3 minutes then you can refresh the page and attempt for installing it again. Once the installation is completed, you need to select the Let’s Encrypt from the extension list. This will be redirected to the page where will be the listings of the available domains. Now you need to select the domain name that you would like to install the Let’s Encrypt SSL certificate. Now if you would also like to secure the ‘www’ subdomain, then you need to check the first box. Else the certificate will only be installed on the example.com rather than www.example.com. Lets Encrypt also provides an option of securing the connections to the Plesk. This will replace the default self-signed certificate that is used by Plesk with the Let’s Encrypt SSL. This is similar to the navigation to Tools & Settings > SSL Certificates and then selecting available certificate for securing the Plesk.